Ready to Simplify Your Holidays? 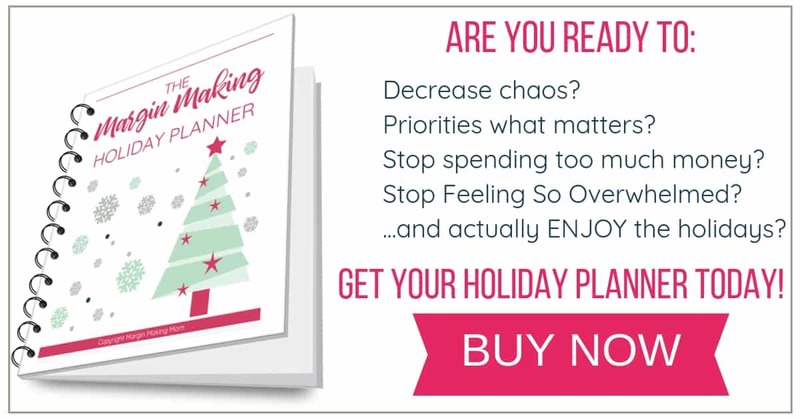 Do you feel overwhelmed by the holidays every year, even though you really want to enjoy them? Are you scrambling from place to place, trying to get more done? Have you spent more money than you have? Do you feel like you never get to really slow down enough to enjoy time with your family? This year, plan to have a simpler and enjoyable holiday season! If you're tired of merely "surviving" the holiday season, it's time for that to change. 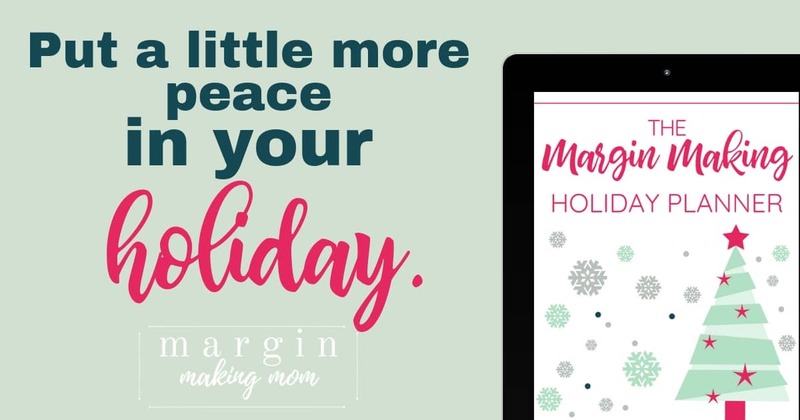 The Margin Making Mom Holiday Planner is for women who want to focus on the things that matter most during the holiday season. 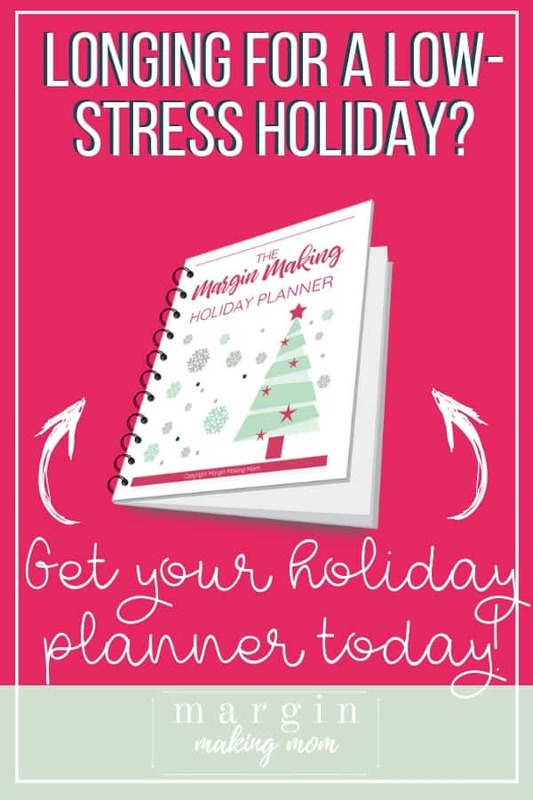 Right now, you can get the printable Margin Making Holiday Planner for only $5! BUY NOW - Only $5! A holiday goal-setting worksheet to help you focus your time and energy on the things that matter most to you. A holiday budget worksheet to help ensure you don't spend more than your budget allows, as well as to help remind you of common expenses to eliminate "surprises" during the season. 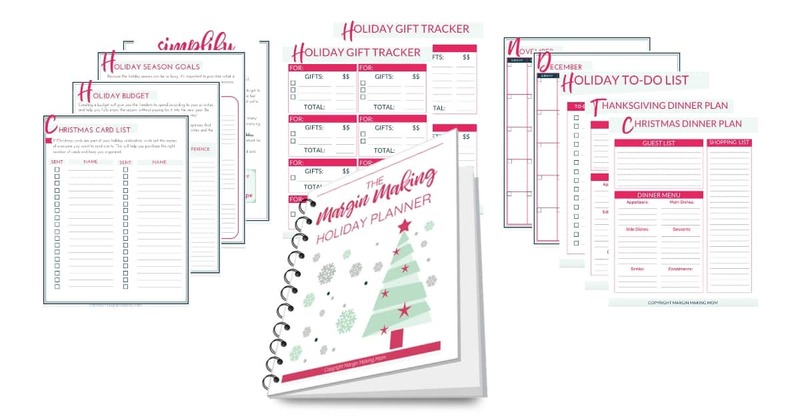 Holiday gift tracker worksheets that allow you to keep track of what gifts you have bought for different people and how much you have spent. Christmas card list to keep you organized while you're sending holiday greetings. Thanksgiving and Christmas dinner plan worksheets that allow you to plan your menu and keep track of your grocery list all in one place. Holiday To-Do List worksheet that encourages you to reduce overwhelm and decrease your mental load during the holidays. November and December monthly calendar sheets where you can keep track of holiday parties, appointments, performances, events, and more. These worksheets are in the form of a convenient printable pdf digital download, so you can print as many copies of the pages as you'd like. The worksheets are also undated, so you can print these off to use every year! I understand how it feels to look back on the holiday season and feel like it's all a blur. Christmas is one of my absolute favorite times of the year. And in an effort to enjoy the festivities, I've been known to take on too much. I want to buy ALL of the Christmas presents, attend every holiday event in town, and spend hours and hours baking and cooking. Unfortunately, that results in me feeling stressed out, overwhelmed, and resentful. Over the last few years, I've managed to simplify the holidays for our family. In fact, I now look forward to the holiday season even more, and I truly find it to be a meaningful time of year for us.